Because alkenes contain at least one double bond between carbon atoms, we describe them as unsaturated compounds. Think of when a sponge cannot hold any more water, it is "full". A saturated molecule can't fit any more single bonds into it. Alkenes can fit more single bonds in (once the double bonds are broken). Alkenes can have more than one carbon-carbon double bond, however you will only ever be expected to draw an alkene with one of these bonds. For ethene and propene, the double bond can only go in one place, however for any chains longer than 3 carbons - this can get a bit more complicated. You do not need to know the structures of all the isomers of butene that can form due to the double bond being in one of two places, just that there can be more than one. The functional group (double carbon bond, C=C) allows alkenes to undergo addition reactions. The reaction is an 'addition' reaction because one molecule combines with another molecule, forming one larger molecule and no other products. 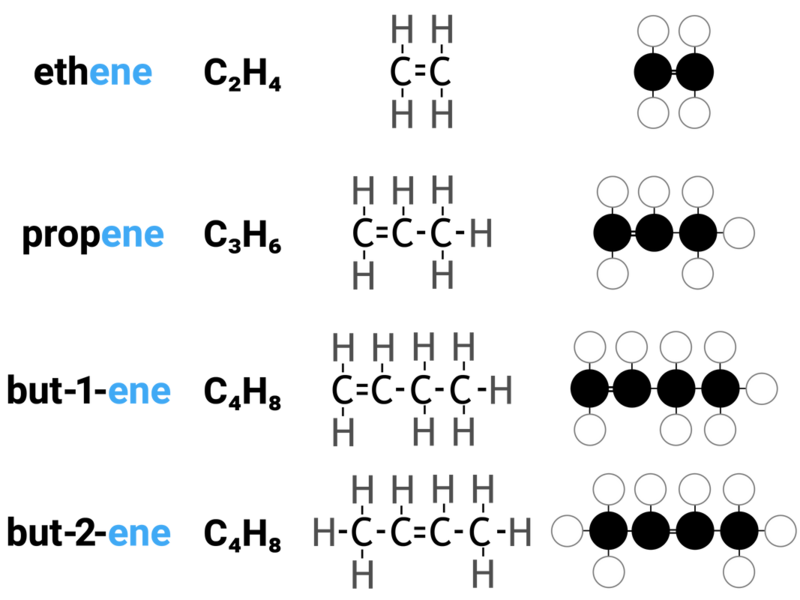 Alkenes react with hydrogen, water and the halogens, by the addition of atoms across the carbon-carbon double bond so that the double bond becomes a single carbon-carbon bond. 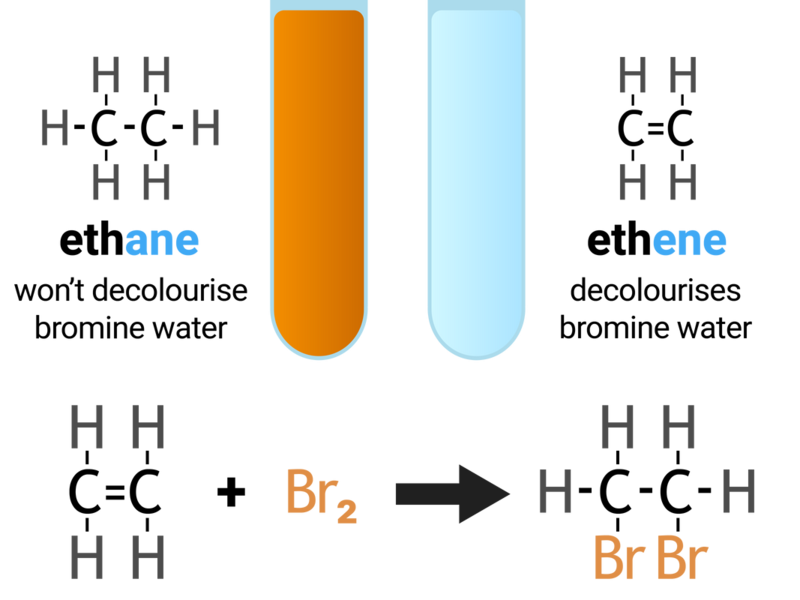 The test for alkenes makes use of the addition reaction, and involves adding bromine water to a sample of hydrocarbon. If an alkane is present the solution stays orange-brown, but an alkene will turn the solution colourless. This is because the bromine is added across the carbon-carbon double bond. Alkenes react with oxygen in combustion reactions in the same way as other hydrocarbons, but they tend to burn in air with smoky flames because of incomplete combustion. Alcohols have the functional group of -OH (hydroxyl), and gives rise to the ending of alcohol. It is responsible for the general reactions that all alcohols can do. The yeast dies when the ethanol concentration reaches about 15%. Fermentation is a slow reaction and takes several days or weeks to finish. If any air is present, the oxygen oxidises the ethanol to make ethanoic acid, making the drink taste of vinegar. Fermentation will produce a dilute solution of ethanol, and needs to be purified to remove water and other liquids (removed by fractional distillation), insoluble substances (removed by filtration), to produce pure ethanol. 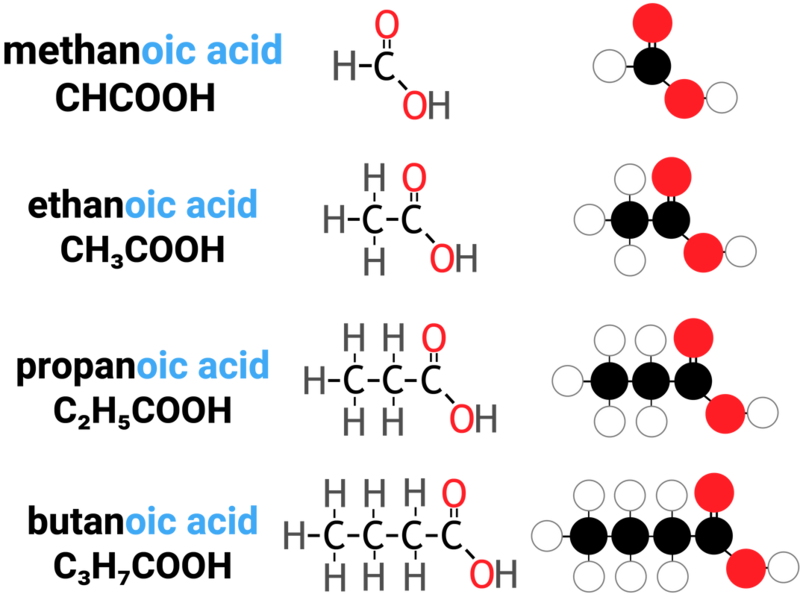 Carboxylic acids have the functional group of -COOH (carboxyl), and gives rise to the ending of carboxylic acid. It is responsible for the general reactions that all carboxylic acids can do. We offer a new way to revise: notes, images, and videos - all written by a UK science teacher to help you pass GCSE chemistry.